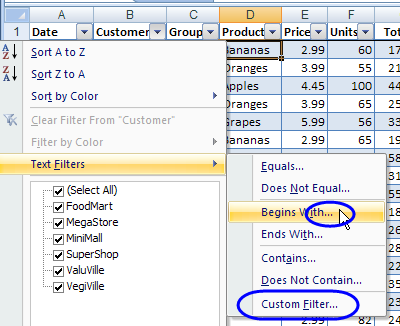 In Excel 2007, and later versions, you should create an Excel Table from your data, and use its built in filtering features. 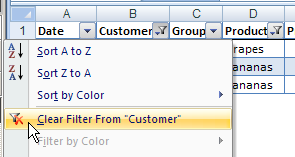 If you are using an Excel Table, you can skip to the next section, Filter One Column. 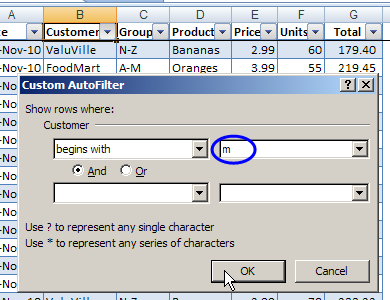 If your data is not in an Excel Table, follow these steps to prepare your list for an AutoFilter. 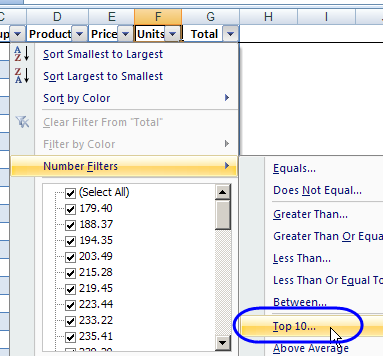 In Excel 2007 and later, if you're using an Excel Table, it has built-in filtering features. 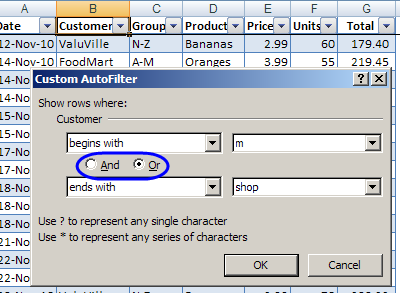 If your data is not in an Excel Table, follow these steps to add an AutoFilter. 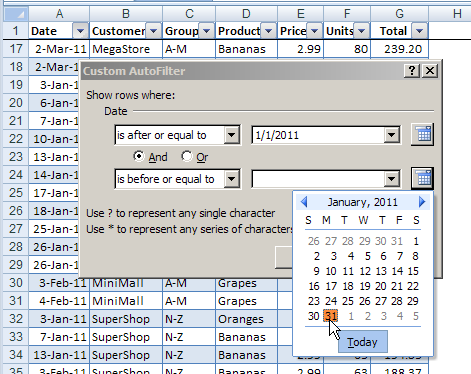 With the Excel Table, or AutoFilter, in place, you can start filtering the individual columns. 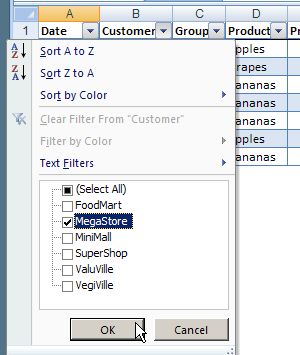 You can filter on just one column, such as Customer, or two or more columns. 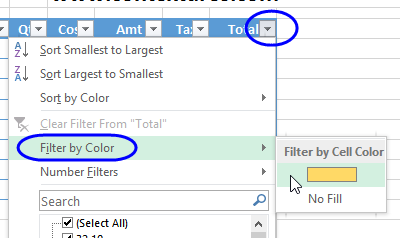 In addition to filtering for text or numbers, you can filter by the cell fill colour, even if that colour was applied by conditional formatting. 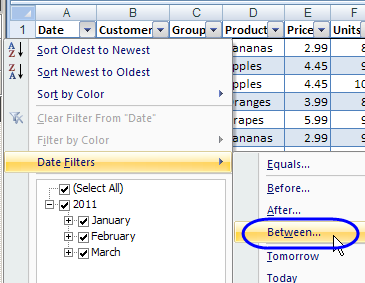 When you open the workbook at a later date, the AutoFilters don't refresh automatically. 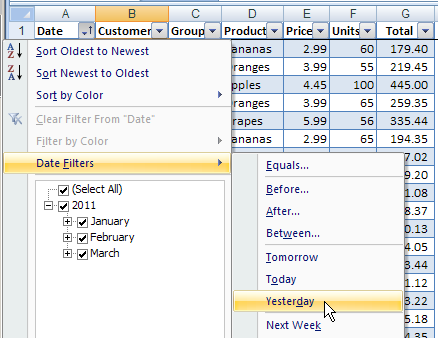 For example, if you used a dynamic date filter, such as Yesterday, the correct day's results won't show in the filtered table when you open the file the next day. 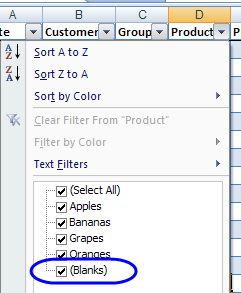 Or, if new data was added to the table, it won't be automatically filtered. 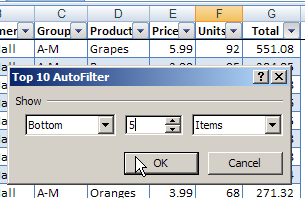 You could create a macro to update the filter, and set it to run when the file opens. 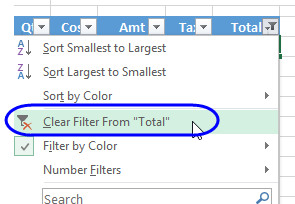 After you apply a filter, you can delete the filtered rows. Make a backup copy of your file first -- just to be safe. 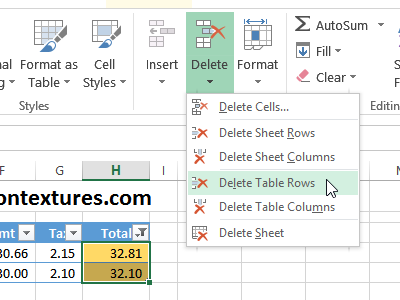 Click on Delete Table Rows. 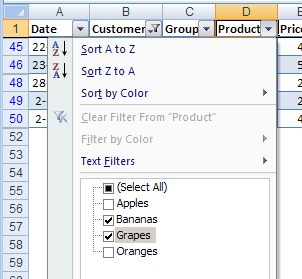 If the list doesn't look right, click the Undo button a couple of times, or press Ctrl + Z to undo the deletion. 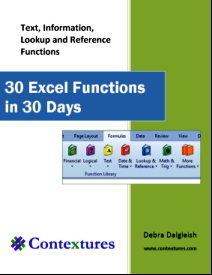 Click here to download a zipped workbook with AutoFilter sample data.